Despite formidable obstacles, [Chávez] has proved it is possible to lead a popular, progressive government that breaks with neo-liberal dogma. Perhaps that is why he is so hated after all. The importance of Venezuela is that it shows that another way is possible. Innovative social programmes, experiments in direct democracy and success in bringing resources under public control offer lessons to anyone interested in social justice and new forms of socialist politics in the rest of the world. Thanks Hugo Chávez for showing that the poor matter and wealth can be shared. He made massive contributions to Venezuela & a very wide world. 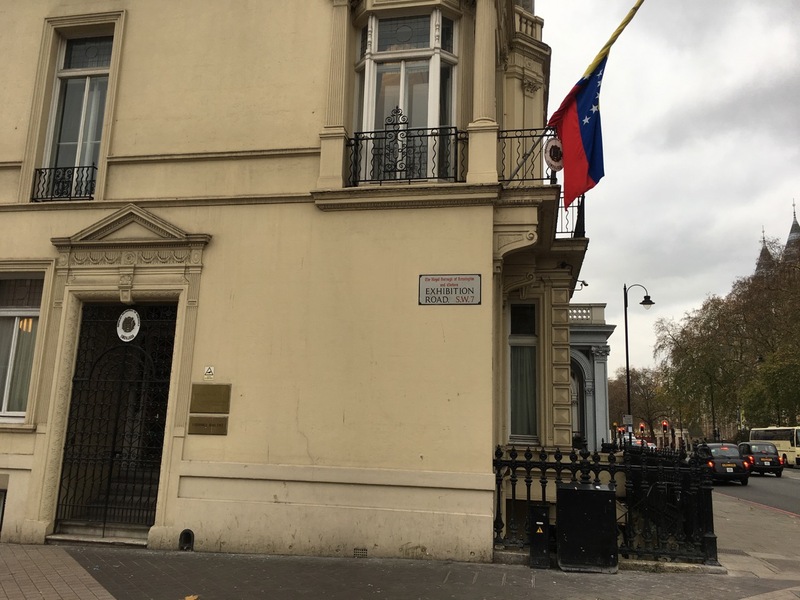 I wrote a few months back about street memorials and last week I passed by one that has appeared outside the Venezuelan embassy in South Kensington. I don’t know the stories of the people in the photographs, and the website referenced on one of the posters doesn’t provide any background, but I assume they were opponents of the ‘Bolivarian Revolutionary’ government of Venezuela. I assume too that they were killed by agents of that government while protesting. There’s no point in running through the sorry, sordid history of how Hugo Chávez, Nicolás Maduro, and their cronies wrecked the economy of the country with the world’s largest known oil reserves. No point either, in wondering how Chávez’s daughter became one of the richest women in South America, how infant mortality rates have increased more than 50% in the last five years, and why Maduro has just banned opposition parties running in next year’s presidential election. Most people who follow the news will know about the state violence, corruption, food shortages, and opposition crackdowns that have become constant features of Venezuelan life in the last ten years. Let’s not dwell too long either, on the recurring delusions of British leftists, forever projecting their fantasies onto faraway lands of whose histories, cultures and languages they know little, be it the Soviet Union in the 1930s, Vietnam in the 1960s, Nicaragua in the 1980s, and Venezuela in the 2000s. There is something absurd about their endorsement of almost any authoritarian leader who spouts anti-capitalist platitudes, and figures like Chávez are smart enough to know that this is the quickest way to gain support from Western leftists. Of course, the likes of Corbyn, Abbott, Milne, and Jones have had less to say about Venezuela as the country has continued its slide into mass poverty, malnutrition and despair, though there will be an occasional cry that the problems are the fault of counter-revolutionaries or American imperialism. Corbyn has also stated that ‘not enough has been done to diversify the economy away from oil’, which is both a masterpiece of understatement and a complete evasion of the actual causes of the crisis. And of course the standard get-out clause, that it wasn’t ‘real’ socialism after all, is already being trotted out by some. One can only pity the next country that is adopted by the Left, wherever and whichever it may be. ‘Unhappy is the land that needs a hero’, wrote the communist Bertolt Brecht in his play Galileo. Unhappy too, the land that needs Corbyn as a champion. But no, let’s not dwell on any of that nonsense. I fear that life for Venezuela’s people will get worse before it gets any better. I hope also that global institutions like the United Nations, the World Bank and the IMF, imperfect as they are, will be ready with aid and assistance as soon the Maduro regime falls. Meanwhile the memorial in South Kensington serves as a small and poignant reminder that behind the headlines and the rhetoric, it is almost always the ordinary folk who pay the price of socialist dysfunction.